Fundamentals of Real Estate Appraisal is a classic text in the field, first published in 1975 and still updated by the original authors. 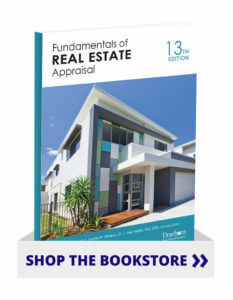 The latest edition of this best-selling text provides a strong foundation for understanding the modern real estate appraisal market. New discussion includes the modern appraisal office, gross living area, the division of outdoor spaces, the concept of curb appeal, interior house design, landscaping plans, Historical Landmark Designation, retrospective value, and financial calculators. This edition includes learning objectives, unit review questions, and a comprehensive set of Instructor Resources to help prepare for class. Additionally, this text covers the basic principles and procedures requirements of the Appraiser Qualifications Board. A course matrix is available for submission.